Ice cream loving zombie moves towards physical health. FILM AT ELEVEN!! I won’t run, rather “sit”, any longer. With ‘Dog the Bounty Hunter’ tenacity Mother Nature and Father Time caught up with me and poked me right in the eye as they stuck their tongues out at me and taunted me with names like: “chubby, pokey, old timer” and the one that really hurt “zombie-boy” (I can’t help it that I walk like a zombie after a long hard day…but self admittedly I could cut down on the moaning and drooling a bit). At forty-six years of age I’ve come to the conclusion that I’ll have to “work” at staying healthy and fit. Anyway…after months of procrastination I will….join a gym again….or more precisely…a fitness center. I had previously “belonged” to this gym a couplea years ago with good results. I lost weight. I could eat anything without regard to gaining weight since my metabolism was running high. I slept less. I looked and felt better since I was agile and lean. Nowadays…not so much. I figure that I’m about fifteen pounds heavier, but it’s the freaking agility thing that’s causing me so much pain. “Moving like an old man”…pain. I move like a G.I. Joe Action Figure. I swivel at the waist and bend at the knees and arms, but other than that, nada. The Tin Man from the Wizard Of Oz movie has more fluid moves than I do. Sure…I’m “easy on the eyes” but that’s not enough any longer. Let’s return to the first time I went to the gym. I had signed up for a “fitness trainer” to show me how to use the machines and help me sort out what kind of exercises I should do, how often I should do them and so on and so forth. A male trainer wasn’t readily available so I told them that I didn’t mind having a female trainer. I did this with a clear conscious figuring that I lived with my wife, and our three teenage daughters, plus I work with plenty of middle aged women who (God bless them) sometimes talk to me like they’re my boss when the opposite is true (but I love ‘em nonetheless)…so I’m used to taking instructions/advice/criticism/feedback and sometimes seemingly endless chatter from women so taking it from a fitness trainer who happened to be a female posed no problems for me; then I met her. I did one more session with Cat, and then snuck around her without doing any more “training” with her. I had seen other trainers working with pagans like me and never saw them crack the whip like old Cat did…so I kept a low profile for that first month or so. 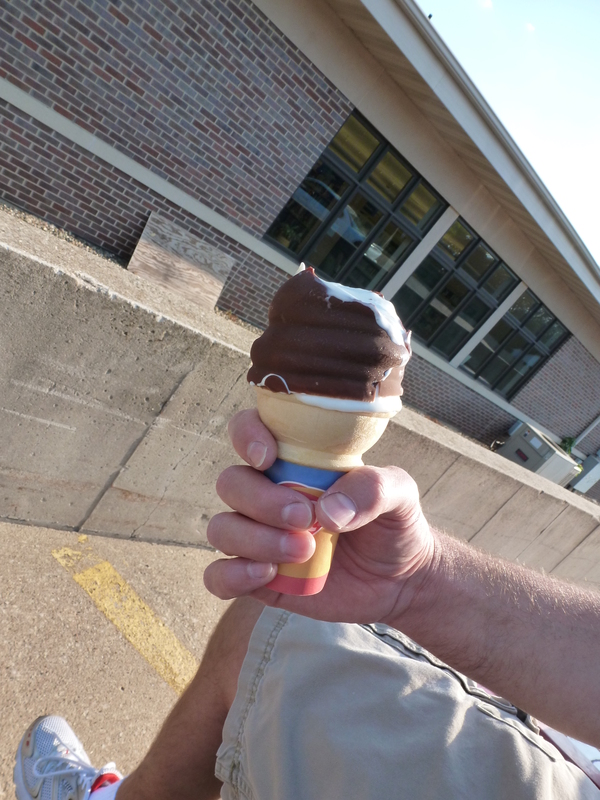 My last chocolate dipped soft-serve Dairy Queen ice cream cone for awhile. Will someone please keep the soft serve ice cream industry afloat in Iowa while I’m on a self imposed “sweets sabbatical”? Anyone? Anyone? You can do it Rich, I’ll be praying for you!